Strawberries are extremely popular, and with good reason – they are healthy, visually appealing, and delectable. Not only do they taste delicious, they are also packed with healthy nutrients. Thanks to these nutrients, the health benefits of strawberries are many, and we’ve lined some up for you. The benefits of strawberries are so varied that they influence almost all the parts of your body. If you’re looking for a tasty fruit that can also keep you healthy, you don’t have to look any further. Here’s what they can do for you. One serving of strawberries gives you 51.5 mg of Vitamin C. Strawberries are an excellent source of Vitamin C, which is an important antioxidant you must have in your diet. These fruits strengthen your immune system in this way and help you look younger. The UV rays present in sunlight expose your delicate eyes to free radicals that may sometimes give rise to cataracts. Cataracts blind vision and are especially prominent in old people. Strawberries are packed with antioxidants, which fight against such free radicals, strengthen the retina and cornea, and ensure good vision. Gaining excellent eyesight is one of the key benefits of strawberries. 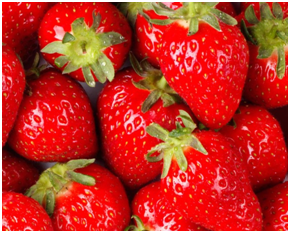 Strawberries have vitamin C and other antioxidants such as lutein and zeathanthin. These nutrients help the body fight the free radicals that normally weaken the immune system and increase the risk of cancer. As people grow older, the collagen in the skin is lost and this leads to unsightly wrinkles. The Vitamin C present in these berries helps in the production of collagen. Strawberries contain yet another compound, ellagic acid, which helps prevent collagen destruction and the skin’s inflammatory response to damaging UV rays. As strawberries pack these two effective compounds, eating them can reverse skin damage to quite an extent and revitalize the skin. Say hello to better and younger-looking skin each time you consume strawberries! 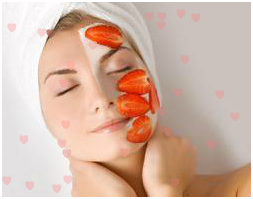 You can spot the benefits of eating strawberries through your beautiful, radiant skin. Blood contains bad cholesterol or LDL that is bad for your heart’s health. Now, strawberries can lower LDL cholesterol in the blood, and in turn prevent the clogging of the arteries. The phytochemicals present in strawberries-ellagic acid and flavonoids-can provide an anti oxidizing effect that benefits the heart in various ways. The phytochemicals present in strawberries have anti-inflammatory properties too, which help prevent arthritis. The levels of the C-reactive protein, which is an indicator of inflammation, are well-controlled in women who consume 16 berries per week. Apart from the key health benefits of strawberries listed above, there are quite a few more. Strawberries also help regulate high blood pressure, provide the fiber content necessary for proper digestion, and with their low sugar content, help in efficient weight management. With a 1.5 cup serving of strawberries, you have a snack that’s less than 100 calories, and much healthier than those 100 calorie snacks that come prepackaged. This is more than enough reason to add these lovely berries in your diet. This entry was posted in Nutrition and tagged benefits of eating strawberries, health benefits of strawberries by Zipheal Editorial Staff. Bookmark the permalink.